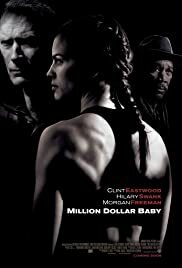 It would be difficult to imagine a more perfect trio of performers the likes of Hilary Swank, Clint Eastwood, and Morgan Freeman in their respective roles in the emotionally-charged "Million Dollar Baby." My favorite scenes were the early sequences in which Maggie (Swank) visits the dowdy boxing gym and co-opts Eastwood's crusty boxing trainer Frankie into becoming her mentor. Along with the veteran, retired boxer Eddie, played by Freeman, the performances were as electric as the Ali shuffle. 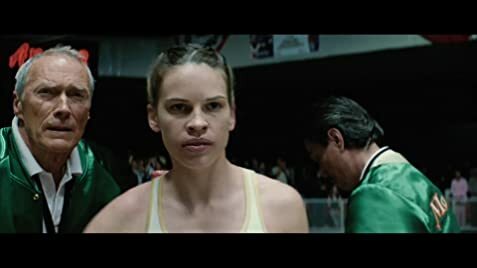 In the overall arc of the story of "Million Dollar Baby," there were three extraneous subplots: (1) Frankie's visits to church and his talks with the priest; (2) the story of the mentally-challenged young man named Danger, who appears in the gym and is taunted by the boxers; and (3) Maggie's family members introduced in two scenes filled with such vulgarity that much of the film's hard-earned credibility was lost. Not only would the film have worked effectively without the subplots, it would have been a much better film without them. While Eastwood's direction was superb, much credit should also go to the designers, especially the stylish work with lighting. I cannot recall a film as dimly lit as this one, and the subdued lighting contributed substantially to the characters and mood evoked in this sensitive film. The three main performances were standouts. But this film was also a very successful team effort.